King of Wands shares the qualities of strength, security and commitment to spiritual growth. A visionary who is energetic and unwilling to edit, rehearse or hold back any part of Self. Generous, but impulsive – excellent leadership qualities when channeled in the right direction. Loyal, courageous, strong, passionate, loves the traditional ways and family life. Dynamic expressions of deep internal shifts – the ability to shed old beliefs and honor the changing perceptions of Self and others. A strong-minded person, able to dominate others by strength of will. His power is derived from a firm belief in his own rightness – he KNOWS the truth; he KNOWS his method is best and he considers it only “natural” for others to follow. Naturally honest, he sees no reason or value in lies. He is positive and optimistic for the same reasons and the energy burns so strongly in him that he does not understand why anyone would wish to express negative attitudes. He is a master of creative energy, for his social commitment has tamed it and put it to use. Do not limit yourself – remain versatile and adaptable. Play out every role – act swiftly and spontaneously – change from moment to moment while retaining your inner sense of self. Liberate your full spirit – as you channel for the great spirit, you become enlightened and enlighten others as you transcend your “ego”. How are you expressing your sense of self? How are you using your decision – making and leadership abilities? Who is controlling the situation? Who do you admire for their sense of self? In the first position: Yours is a call to leadership of the highest order, to lead others on the path to greater understanding of the spirit. In the third position: Think well on this card for he is coming to you in one guise or another. For there is order to be put in your spiritual house, to take charge and make things right. More leadership and control is needed here. In the fourth position: Your earliest tapes of imprint are of this spiritual figure of authority, perhaps your own father. but it could be of an older family figure such as a grandfather or of course someone outside the family, perhaps someone famous whom you came to admire. 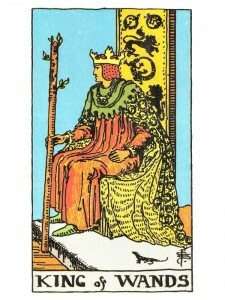 In the fifth position: The King of Wands occupies your thoughts, either in his person or his characteristics. Clarification of spiritual issues, of messages that affect those who listen to you, is the issue, of formal procedures in spiritual business – this is the nature of your mental moment. In the sixth position: As the mature man with the fiery spirit comes into your Emotional Plane in the near future, you have an opportunity to open up your heart to greater mysteries of appreciation as your emotional vision is enhanced manyfold. In the seventh position: In the near future the mind will be focused on this king or his lessons. Your mind is coming to accept the role of spiritual leadership that lies in its path. In the eighth position: This king is already in your house of physical/material affairs. Things may be glowing with his presence. Sometimes guardian angels can be very physical. In the ninth position: The King of Wands fills your heart. It may be his person that attracts and occupies you or his lessons may be part of a creative project on your drawing board. In the tenth position: It is time for you to pick up the wand. You must trust yourself eventually, why not now? This is your next lesson, none other.